One of the most highly rated and recommended notebooks for a bullet journal is the Leuchtturm1917 A5 notebook series. Part of this is because the creator of the Bullet Journal system uses these notebooks. In fact, he endorses them so much the company actually created an official Leuchtturm1917 Bullet Journal Notebook! Leuchtturm1917 offers a plethora of notebooks and planners in all shapes and sizes. They even offer some additional notebook options, like a musical notebook to write out tunes! Isn’t that pretty handy? Honestly, it’s easy to go on and on about how wonderful the Leuchtturm1917 notebook is. However, I’m going to have to put everything that’s not bullet journal related aside. Including how to pronounce it. I know it’s German for “lighthouse”, but that’s about as far as I can get. Seriously, don’t make me try to say it. I will get laughed at! You may see me occasionally abbreviate the Leuchtturm1917 notebook as “LT” for convenience sake! 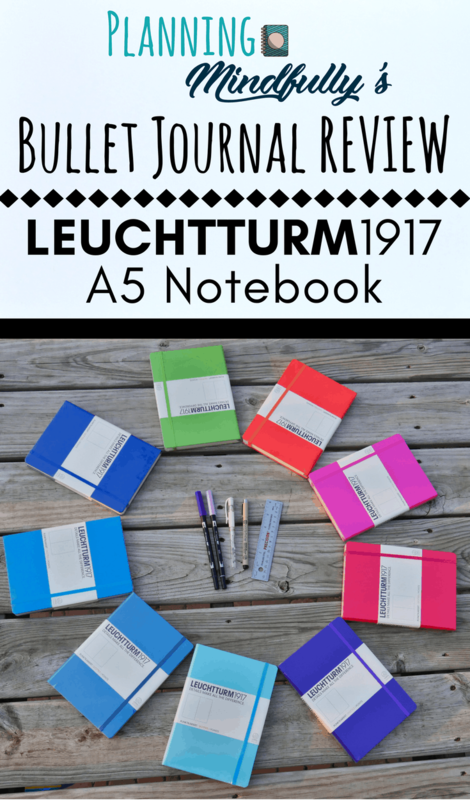 Note- This is a review of the Leuchtturm1917 A5 notebook ONLY, as this is the most commonly used version for bullet journals. 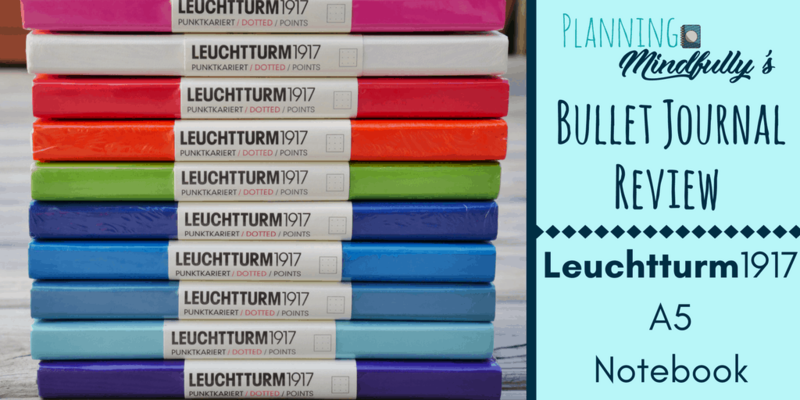 The Leuchtturm1917 A5 comes in many different colors, too! This picture only features just a few of the stunning colors the notebook has to offer. 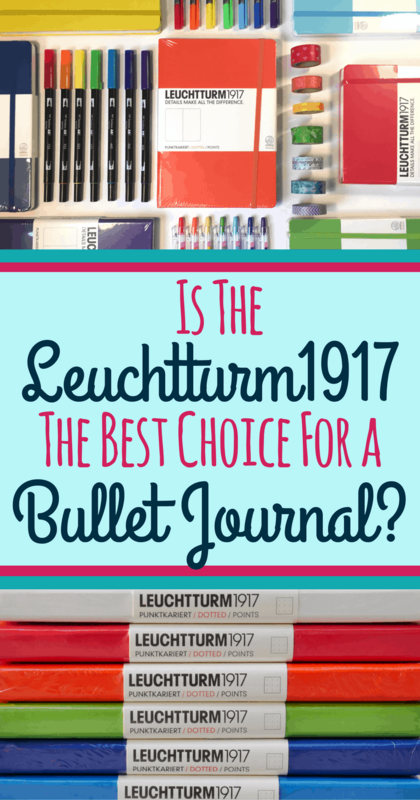 So, why is the Leuchtturm1917 A5 notebook recommended for bullet journals? The company takes the hard work out of the equation by numbering the pages, providing an index, and including 2-3 bookmarks. Again, it’s hard not to gush how wonderful the notebooks are! So I will take each point mentioned above a little more in detail. The A5 size is not exclusive to the Leuchtturm1917. It’s also worth noting the notebook does come in other sizes! But the beauty of the A5 is that for most bullet journalers, this size is not too large nor too small. It fits well in most bags and purses. The approximate size is 8.3 inches by 5.8 inches. The hardcover is a little thicker; it has 249 pages. The softcover has 121 pages. Each have 8 perforated pages in the back. Many bullet journalers utilize an index to have a place to keep track of their collections, trackers, and layouts. Well, Leuchtturm1917 has already built it into the front of your notebook. Thank you! 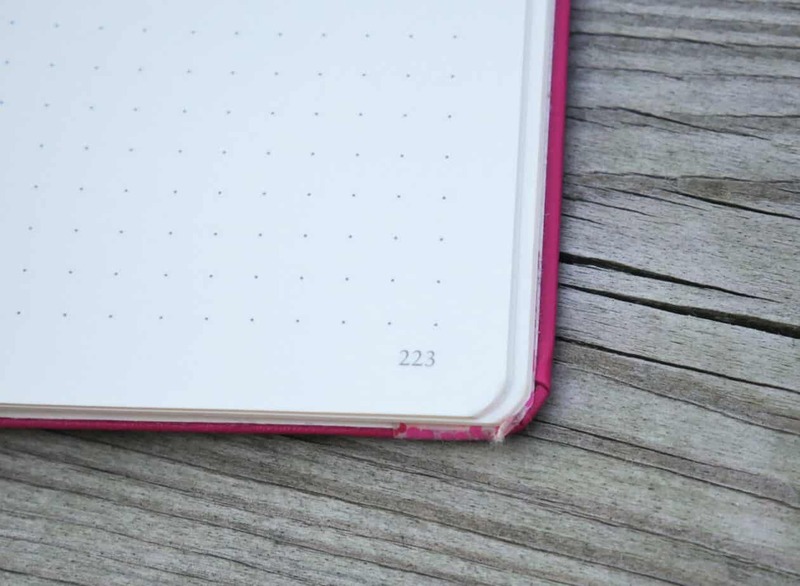 Depending on the notebook you choose, you may have 2-3 pages for the index. The index has two components; a place for the page topic, and which pages that topic are in. Wait, you have to number your pages? Leuchtturm1917 has you covered. Each page is labeled in the bottom, outside corner. No painstakingly numbering each page by hand. Another cool feature about the Leuchtturm1917 A5 notebook is that you aren’t limited to the style of the pages. A lot of companies you are pretty much stuck with one format. That isn’t necessarily bad, but choice is really powerful! I absolutely love the dots… and the numbered pages too! 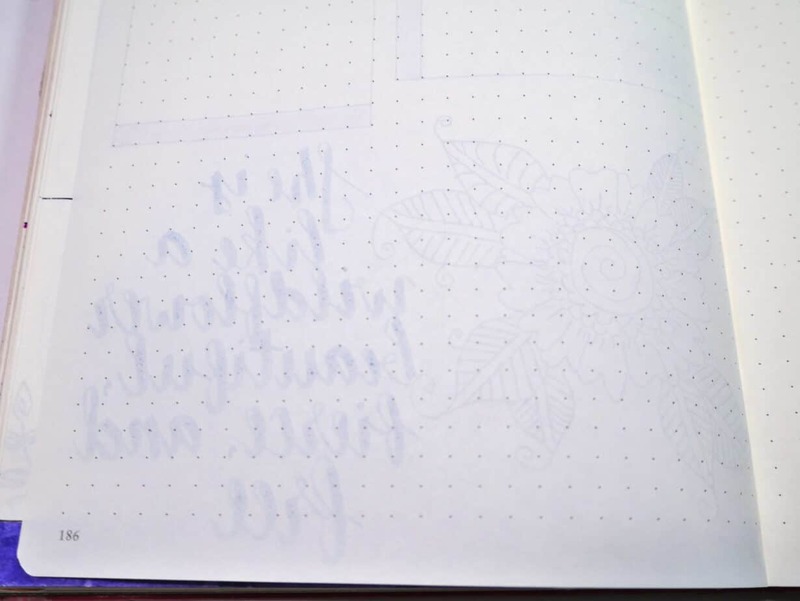 The dot grid version is probably the most common version used in the bullet journal world. Why is the dot grid preferable? Well, it’s easy to grab a ruler and make your own lines. You aren’t bound by structure, yet the dots make it much easier to maintain neatness. You can choose whether you would like to incorporate them in your spreads and layouts. The dots are spaced 5 millimeters apart from each other. Each page has 39 dots vertically, and 27 dots horizontally. This knowledge will make your life SO much easier! No lines. No dots. Nothing. The plain Leuchtturm1917 has numbered pages and an index. Beyond that, you’re on your own for setup. Great for those who like to freestyle or use a lot of drawn art in a bullet journal. 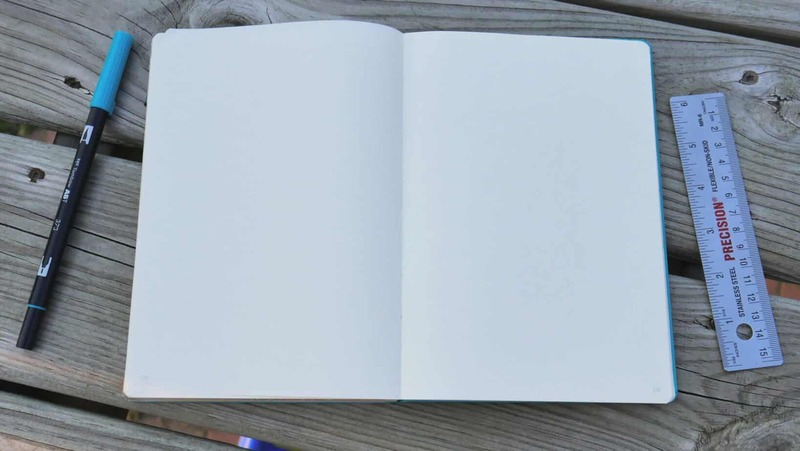 Note- The plain Leuchtturm1917 does include a separate sheet of paper in the notebook. One side has squared format, while the other has the lined format. What can you do with these? 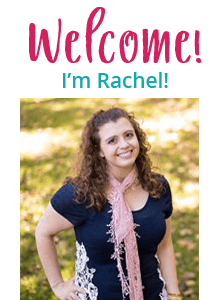 If you do need a little structure for your page, you place whichever side you want to use up. Then slide the sheet underneath the page you’re going to write on. You should be able to see the squares or lines underneath the page. Just be careful not to jostle the page underneath! Otherwise you may get uneven lines. Hate using a ruler but still want to make straight lines? The squared Leuchtturm1917 may be for you. While I have not owned a squared LT notebook, the lines are not particularly heavy. But you can use a pen to trace over the lines for more obvious boxes and lines. The lined Leuchtturm1917 functions more like a general notebook as it only features horizontal lines. You are capable of being flexible and creating different structure. 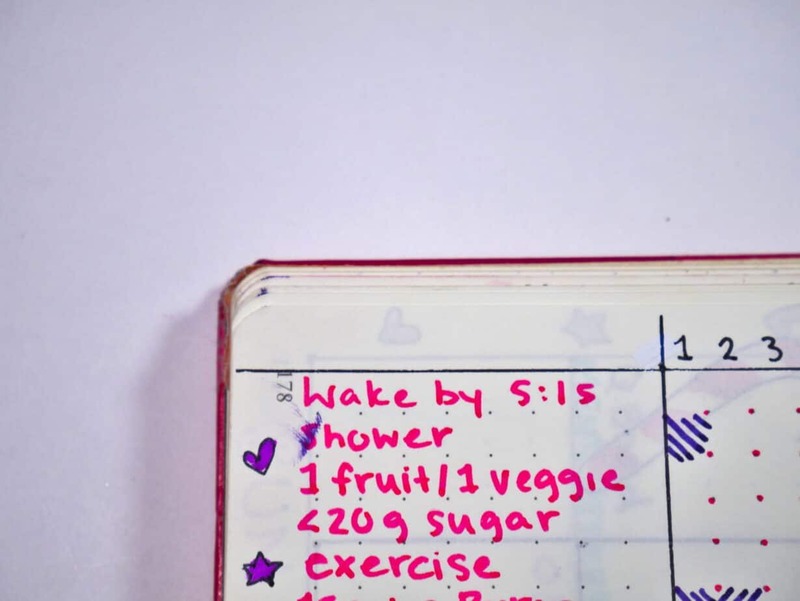 If you prefer to write daily entries, or intend for your bullet journal to function more as a journal than a to-do list or a planner, you may prefer this style over the others. The Leuchtturm1917 handles many different pen types beautifully! Each page is 70 gsm. In simpler terms, the weight of the paper is very lovely. It’s not so thin that the pages bleed when you use ink. It’s not so thick that the pages feel clunky when you turn them. The Leuchtturm1917 handles watercolor very well. While I’ve only dabbled in watercolor brush pens at best, this article from Little Coffee Fox shows some lovely examples of watercolor in the notebook. (It also reviews another type of notebook, but probably the best example of it in the Leuchtturm1917). I also feel like they handle washi tape extraordinarily well. If you need to take it out, most washi tape glides off the page with minimal pressure. I’ve spent majority of the article discussing the benefits of the Leuchtturm1917 A5 notebook. However, I think it’s important to lay out a few negative aspects. This is probably the biggest complaint I receive. The cover is made of leather, and the pages are high quality. Thus, these factors do drive the price up. The cost usually falls between $20-$25 USD, depending on shipping and tax. Yes, you can get a $2 notebook at the store and make a bullet journal work with it. There are also some lovely dot grid notebooks on Amazon for a quarter of the cost. Personal Opinion: In regard to cost, it’s up to you to take it for what it’s worth. You definitely get what you pay for. I use lesser quality notebooks almost daily. I definitely see far less bleeding in the Leuchtturm1917 than generic notebooks. 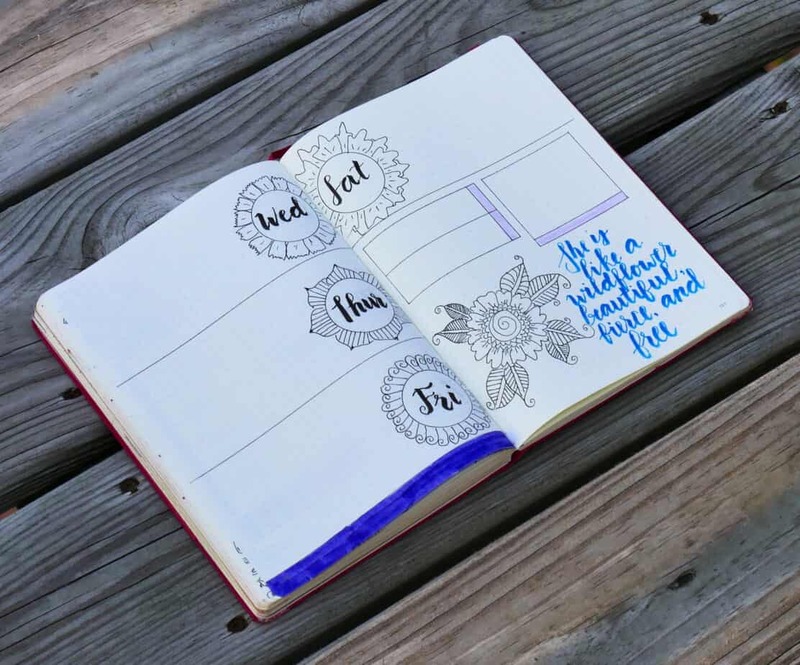 If cost is a factor, please don’t let that discourage you from trying bullet journals. As I said, you can create a beautiful bullet journal for less. Oops… I closed my notebook too fast! Some wetter types of ink do take a little longer to dry in the Leuchtturm1917. This may be more of a personal issue as I’m very used to just being able to write something and close a notebook with no concern. I had mentioned above the Leuchtturm1917 is pretty good with bleeding, too, but a heavier hand and multiple passes with ink through a similar area may cause some bleeding. Personal recommendation: Consider keeping a few pages blank at the beginning or end for pen testing. Not only do pen testing pages look really pretty as a collection, but you get the opportunity to see how the ink handles in your notebook. Be bold! Write a sentence. Run your finger across it. See if it smudges. Then write another sentence. Let it dry a few minutes. Repeat the instructions as above. It’s very critical you learn how various types of ink handle in your Leuchtturm1917 to prevent bigger frustrations down the road. I mentioned earlier that the notebook page size is nice because it’s not too thick, and not too thin. However, it’s not quite thick enough to stop ghosting. Ghosting is the ability to see the shadows of the ink on the other side of the page. Ghosting honestly frustrates a lot of people. I’ve learned to deal with it. A high quality notebook will not make your bullet journal better. Yes, a high quality notebook will handle various types of pens better than a cheaper notebook. But just owning a high quality notebook will not improve your doodling. It will not make you an amazing calligrapher. You are still responsible for taking the time to improve your skills with writing, coloring, and drawing. Personal tip: If you aren’t a fabulous artist or calligrapher (like me! ), you may find it very beneficial to invest in a cheaper dot grid notebook in addition to your Leuchtturm1917. Use the cheaper notebook to try out doodles, color blending, and writing practice before putting it in your LT.
Do you use a Leuchtturm1917 A5 notebook? Or something else? Please tell me what notebook you use in the comments! I’m always looking for different notebooks to try and review. Eventually hoping to do comparison articles as well! PS- New to the bullet journal world and want to learn about other terminology and supplies you should know? This Beginner’s Glossary is a great starting point! Please share this image below on Pinterest! Lovely review! I’m getting my LT in few days (hopefully) and can finally dive into bullet journal world. I tried to start with a cheaper notebook, but found it really frustrating because of the bleeding and ghosting (even when the gsm was same as in LT notebooks). I use a Lemome journal, bought on Amazon for about $10. I’m the kind who like thick paper, so the first time I flipped through an L.T. I thought it was WAY too thin. The Lemome is 100 gsm and I get absolutely no ghosting. If I use a heavy hand with water based products it can slightly bleed, but I’ve learned to “lighten up” and it’s fine. I have wondered what the big deal was with the L.T. so thanks for the review!! 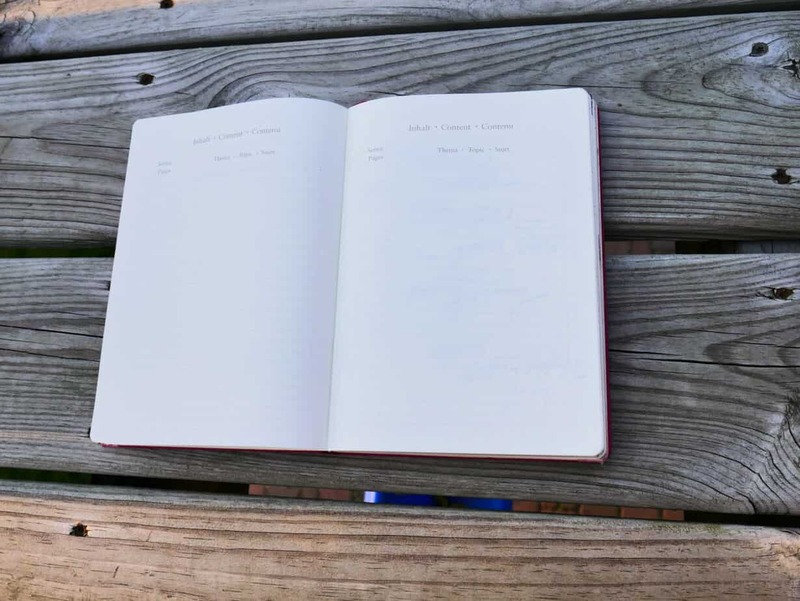 I came across this review while reading your review of the Scribbles That Matter notebook – I might try that one out next!